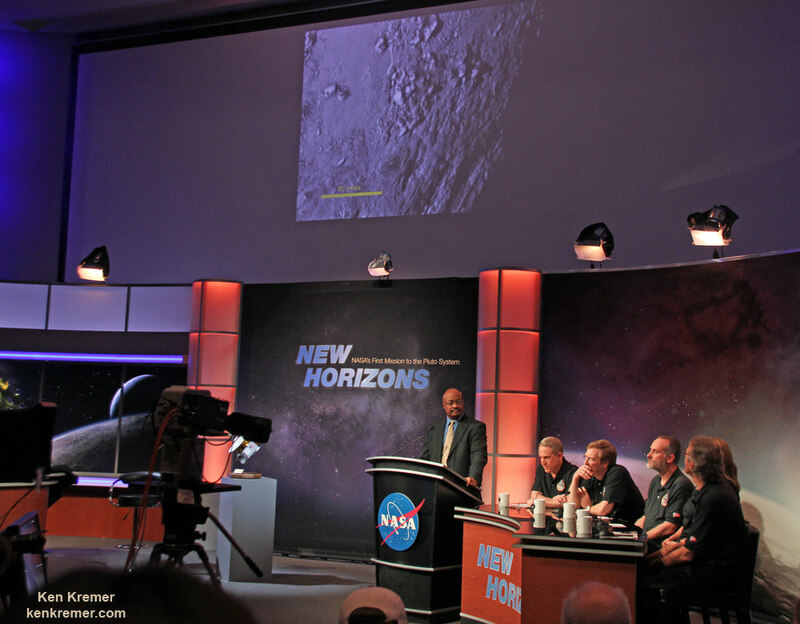 APPLIED PHYSICS LABORATORY, LAUREL, MD – Scientists leading NASA’s historic New Horizons mission to the Pluto system announced the first of what is certain to be a tidal wave of new discoveries, including the totally unexpected finding of young ice mountains at Pluto and crispy clear views of young fractures on its largest moon Charon, at a NASA media briefing today (July 15) at the Applied Physics Laboratory (APL) in Laurel, Maryland. A treasure trove of long awaited data has begun streaming back to Mission Control at Johns Hopkins University Applied Physics Laboratory to the mouth watering delight of researchers and NASA. With the first ever flyby of Pluto, America completed the initial up close reconnaissance of the planets in our solar system. Pluto was the last unexplored planet, building on missions that exactly started 50 years ago in 1965 when Mariner IV flew past Mars. “Pluto New Horizons is a true mission of exploration showing us why basic scientific research is so important,” said John Grunsfeld, associate administrator for NASA’s Science Mission Directorate in Washington. 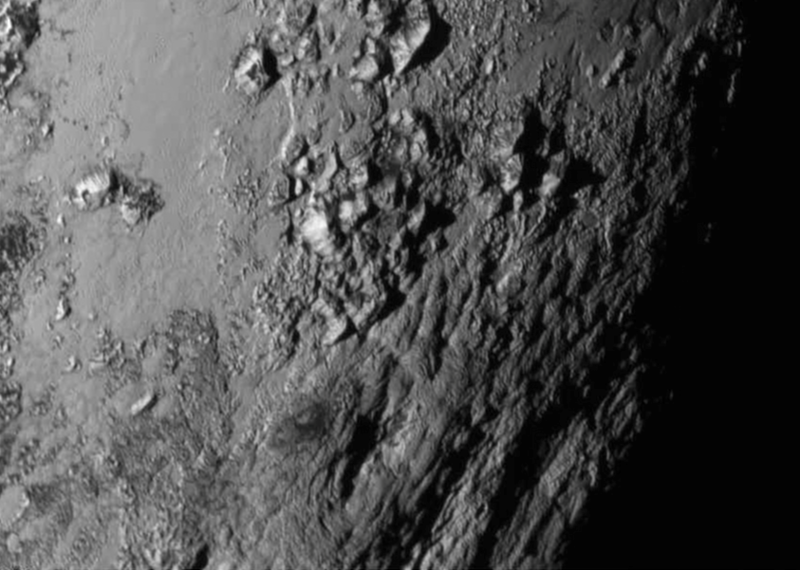 The new close-up image released today showed an icy mountain range near the base of the heart with peaks jutting as high as 11,000 feet (3,500 meters) above the surface, announced John Spencer, New Horizons science team co-investigator at the media briefing. Spencer also announce that the heart shaped region will now be named “Tombaugh Reggio” in honor of Clyde Tombaugh, the American astronomer who discovered Pluto in 1930. “I never would have imagined this!” Spencer exclaimed. The finding of ice mountains has major scientific implications. Unlike the icy moons of giant planets, Pluto cannot be heated by gravitational interactions with a much larger planetary body. Some other process must be generating the mountainous landscape, said the team. “This may cause us to rethink what powers geological activity on many other icy worlds,” says Spencer of SwRI. “Pluto may have internal activity. There may be geysers or cryovolcanoes,” New Horizons principal investigator Alan Stern of the Southwest Research Institute, Boulder, Colorado, said during the media briefing. However there is no evidence for them yet. Additional high resolution images for “Tombaugh Reggio” area are being transmitted back to Earth today and will continue. “Finding a mountain range of ice is a complete surprise,” Stern noted. 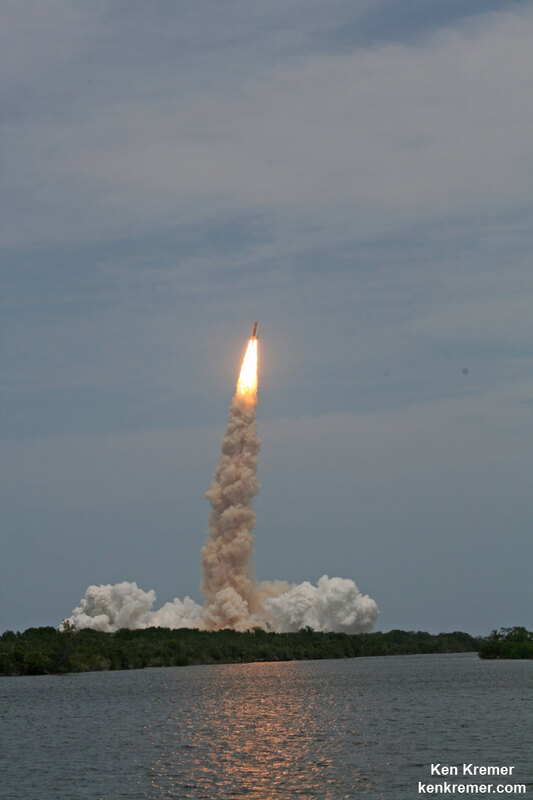 After a nine year voyage through interplanetary space, New Horizons barreled past the Pluto system on Tuesday, July 14 for a history making first ever flyby at over 31,000 mph (49,600 kph), and survived the passage by swooping barely 7,750 miles (12,500 kilometers) above the planet’s amazingly diverse surface. The team had to wait another 12 hours for confirmation that the spacecraft lived through the daring encounter when signals were reacquired as planned at 8:53 p.m. EDT last night. Since New Horizons swung past Pluto to continue its voyage, the probe is now more than million miles outbound just 24 hours later. APPLIED PHYSICS LABORATORY, LAUREL, MD – With this morning’s (July 14) do or die flyby of Pluto by NASA’s New Horizons spacecraft at 7:49 a.m. EDT while traveling over 3 billion miles away, America completed the initial up close reconnaissance of the last explored planet of our solar system at its frigid, far flung reaches and revealed a remarkably differentiated world dazzling us with alien terrain far beyond anyone’s expectation. New Horizons barreled past Pluto for a history making first ever flyby at over 31,000 mph (49,600 kph) and passed only 7,750 miles (12,500 kilometers) above the planet’s amazingly diverse surface. To mark the occasion, NASA released the highest resolution image ever taken of Pluto as the probe swooped past its prey this morning, centered on the two lobed, differentiated ‘heart’. But because the one ton piano shaped spacecraft has been out of touch with Mission Control for the past day as planned and busily gathering hordes of priceless data, confirmation of a successful flyby didn’t reach Mission Control on Earth until half a day later when New Horizons ‘phoned home’ with critical engineering data confirmed the health of the probe at 8:53 p.m. EDT this evening- basically saying “I’m Alive”. “With this mission we have we have visited every planet in our solar system,” proclaimed NASA Administrator Charles Bolden this evening, July 14, to a packed house of cheering team members, invited guests and media including Universe Today at the Johns Hopkins University Applied Physics Laboratory (APL) in Laurel, Maryland, during a live NASA TV media briefing shortly after accomplishing the historic feat after the nine year interplanetary voyage. “We did it! 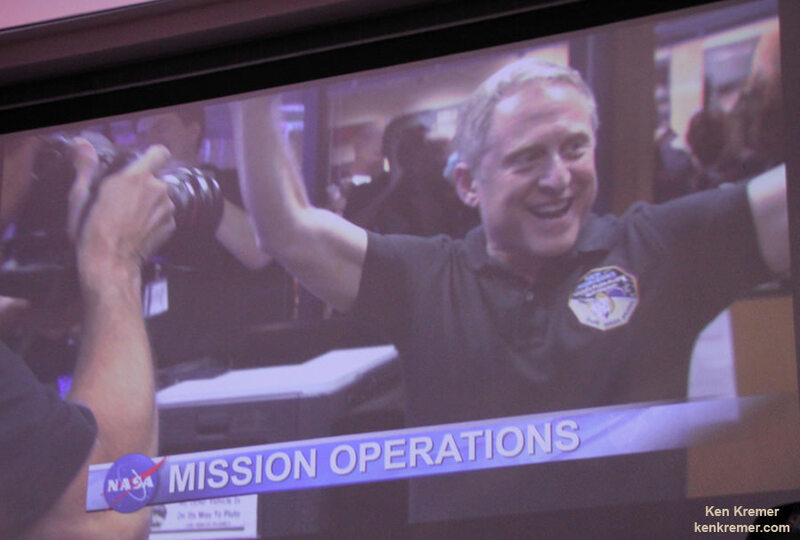 exclaimed New Horizons principal investigator Alan Stern of the Southwest Research Institute, Boulder, Colorado, during the live media briefing. “That’s one small step for New Horizons, one giant leap for mankind,” Stern added, paraphrasing humanity’s first moonwalker, Neil Armstrong. The Pluto flyby took place on the 50th anniversary of the first interplanetary flyby by America’s Mariner 4 spacecraft when it soared past Mars in 1965. “Today we inspired a whole generation of new explorers,” Bolden said to the crowd emotionally. “And you have more to do!” – as he pointedly acknowledge a crowd of young people in the room. Pluto is covered by a spectacular array of craters, mountains, valleys, a whale shaped dark feature and a huge heart-shaped continent of pinkinsh bright ice as seen in the image taken on July 13 when the spacecraft was 476,000 miles (768,000 kilometers) from the surface. 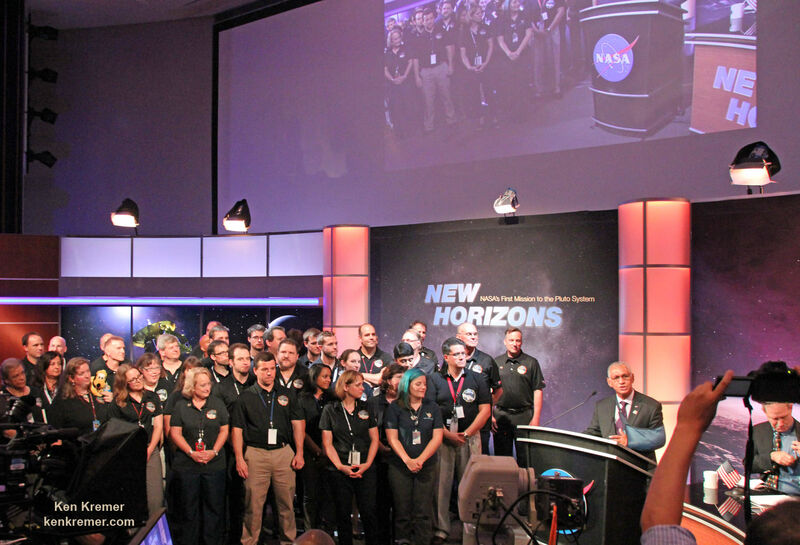 “Every mission expands our horizons and bring us one step further on the Journey to Mars,” said Bolden regarding NASA’s agency wide plans to send astronauts to the Red Planet during the 2030s. Tomorrow, the more than year long data playback begins. “The best is yet to come,” said John Grunsfeld, NASA Associate Administrator for the Science Mission Directorate, at the media briefing. Congratulations rolled in from around the world including President Obama and world renowned physicist Stephen Hawking. 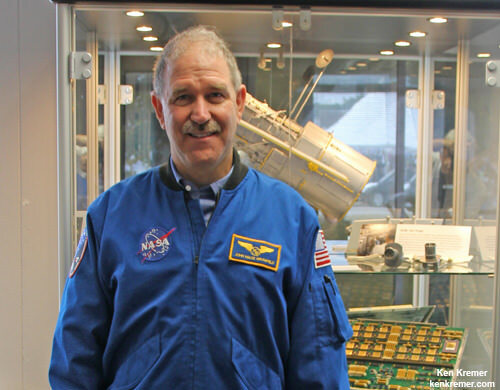 Watch for Ken’s continuing onsite coverage of the Pluto flyby on July 14/15 from the Johns Hopkins University Applied Physics Laboratory (APL). At long last NASA is heading back to Jupiter’s mysterious moon Europa and doing so in a big way – because scientists believe it harbors an alien ocean of water beneath an icy crust and therefore is “one of the most promising places in the solar system to search for signs of present-day life” beyond Earth. Top NASA officials have now formally and officially green lighted the Europa ocean world robotic mission and given it the “GO” to move from early conceptual studies into development of the interplanetary spacecraft and mission hardware, to search for the chemical constituents of life. “Today we’re taking an exciting step from concept to mission, in our quest to find signs of life beyond Earth,” said John Grunsfeld, associate administrator for NASA’s Science Mission Directorate in Washington, in a NASA statement. “Observations of Europa have provided us with tantalizing clues over the last two decades, and the time has come to seek answers to one of humanity’s most profound questions,” said Grunsfeld. Water is a prerequisite for life as we know it. “We know that on Earth everywhere there is water we find life,” says Robert Pappalardo, Europa mission project scientist. “It’s a great day for science,” said Joan Salute, Europa program executive at NASA Headquarters in Washington. In a major milestone leading up to this mission development approval, NASA managers recently announced the selection of the nine science instruments that will fly on the agency’s long awaited planetary science mission to this intriguing world that many scientists suspect could support life, as I reported here last month. “We are trying to answer big questions. Are we alone,” said Grunsfeld at the May 26 media briefing. Planetary scientists have long desired a speedy to return on Europa, ever since the groundbreaking discoveries of NASA’s Galileo Jupiter orbiter in the 1990s showed that the alien world possessed a substantial and deep subsurface ocean beneath an icy shell that appears to interact with and alter the moon’s surface in recent times. NASA’s Europa mission would blastoff perhaps as soon as 2022, depending on the budget allocation and rocket selection – whose candidates include the heavy lift Space Launch System (SLS) now under development to launch astronauts on deep space expedition to the Moon, Asteroids and Mars. The solar powered Europa probe will go into orbit around Jupiter for a three year mission in order to minimize exposure to the intense radiation region that could harm the spacecraft. It will be equipped with high resolution cameras, spectrometers and radar, several generations beyond anything before to map the surface in unprecedented detail and determine the moon’s composition and subsurface character. And it will search for subsurface lakes and seek to sample erupting vapor plumes like those occurring today on Saturn’s tiny moon Enceladus. There will many opportunities for close flybys of Europa during the three year primary mission to conduct unprecedented studies of the composition and structure of the surface, icy shell and oceanic interior. “During the three year mission, the orbiter will conduct 45 close flyby’s of Europa,” Curt Niebur, Europa program scientist at NASA Headquarters in Washington, told Universe Today. The mission currently has a budget of about $10 million for 2015 and $30 Million in 2016. Over the next three years the mission concept will be further defined. The mission will be managed by NASA’s Jet Propulsion Laboratory (JPL) in Pasadena, California and is expected to cost in the range of at least $2 Billion or more. The nine science instruments are described in my earlier story- here. They will be developed and built by Johns Hopkins University Applied Physics Laboratory (APL); JPL; Arizona State University, Tempe; the University of Texas at Austin; Southwest Research Institute, San Antonio and the University of Colorado, Boulder. Right now there is another NASA probe bound for Jupiter, the solar powered Juno orbiter that will investigate the origin of the gas giant. But Juno will not be conducting any observations or flyby’s of Europa. NASA Chief Scientist John Grunsfeld took Stephen Colbert’s “Colbert Report” audience on a guided tour through the seven minutes of terror that the Curiosity rover will endure to land on Mars, and the two also discussed the possibility of life on Mars. Grunsfeld also shocked Colbert for a moment when he said the Curiosity rover won’t discover a thing … but then continued to say it will be the scientists who make the discoveries, and Grunsfeld predicted it will be an amazing 2 years for the MSL scientists during Curiosity’s prime mission.